Chia Fresca: A Natural Energy Drink! Excuse me, but I must ask you what you are drinking? I’ve never seen anything like it before! Those are the kinds of questions a girl gets asked when she’s toting this drink to a spin class. You get stares, sideways looks, and nervous smiles. The people out there are curious and they need to know that you aren’t drinking little black bugs. They need to be able to sleep at night. For goodness sake, tell them what you are drinking so they can get back to their workout! So I tell them with a big smile, Chia bugs. Then there’s an awkward pause and even more confusion. Ok, ok, it’s actually a healthy beverage called Chia Fresca which has been a popular drink in Mexico and Central America for many years. I’m sure many of you have heard of it before or even made it yourself. It’s made up of water, chia seeds, lemon or lime juice, and sweetener. When chia seeds are soaked in water a gelatinous coating forms around the seed very similar to a tomato seed. This makes it very easy to swallow so the seeds don’t get stuck in your throat. Chia Fresca probably isn’t for people with texture issues (cough, cough husband), but I’ll leave that up to your discretion. I recently brought it back into my life to get a boost of Omega-3 fatty acids in my diet. It’s so much more fun than drinking plain water! Plus, it’s a total conversation starter much like bringing a Green Monster into the work place. I know you’ve been there. Well, why not bring Chia Fresca and show them just how crazy you can really be? Chia seeds like to get stuck in your teeth. You were warned. Chia Fresca is said to boost energy levels too. I’m not really sure if it boosts my energy or not, but I sure feel happy and hydrated when I drink it. When I have some on hand, I like to pair it with coconut water for a natural potassium boost after a tough workout, but water is just fine too. Edited to add: Some of you were asking me about the thickness of this drink so I thought I would add a few words on this. I wouldn’t say it has a smoothie-like texture, but it’s more like a water consistency just with a whole slew of gel-y seeds in it. Does that make any sense? You just have to try it for yourself. My guess is you will either love it or hate it. 1. Add chia and water into a jar or glass and stir very well to combine. Let sit for 10 minutes to allow the chia seeds to swell up. I like to use a jar with a lid so I can shake it up really well and break up the clumps of chia. 2. Add lime or lemon juice and sweetener to taste. Stir (or shake) well to combine and enjoy! Note: Chia seeds will sink and collect at the bottom of the glass quickly. Give it a good stir as needed. Wishing you a very happy (and hydrated) weekend!! I love this stuff–around here, we call it iskiate, which is the Tarahumara word for it. Runners are nuts for it, after it got so much love in _Born to Run_. And it’s just plain delcious! I like this idea! It would be great after a long run in the summer. Do you think you could put this together and leave it in the fridge- like overnight- and just reshake or do you think it would get gross? I did this just yesterday with my juice! I made it in one of those drink-box tupperware containers the night before and drank it with my lunch. Bonus – the juicebox has a straw, so I didn’t waste any of the chia goodness by getting it straight from the bottom. Love that idea :) Thanks for sharing! I,ve been using Chia seeds for about a month in my green smoothies and I always make way to much so it does sit in fridge until next day. No problem. I keep soaked chia seeds in my fridge. I add them to smoothies and oatmeal etc. I love them and I’m trying this water! Hi Angela. It’s interesting that you post this because I’ve just started drinking something similar after visiting Lyfe Kitchen in Palo Alto CA last weekend, and am loving it. Another idea to add to the mix…ginger juice (grate some ginger and squeeze out the juice and add). YES! I get that frequently at Lyfe too! It’s one of the ‘cooler’ drinks. Love your ginger idea! That sounds great too. I’ll have to try that out! Palo Alto is right by me, I’ll have to check out Lyfe, thanks for sharing! I just bought some chia seeds and haven’t had a clue what to do with them. I will try this, thanks! Throw a spoonful of chia seeds into oatmeal – they swell up and make your oatmeal fluffy and voluminous. Also add chia seeds to homemade granola or granola bars. Make endurance crackers or basic oatbars from this website. Top your salads with chia seeds. Make overnight oats in the fridge and add a tablespoon or two of chia to those. The question, really, is what can’t you do with chia!!? Mix chia seeds and coconut milk and place in fridge over night or at least an hour. Place all ingredients in blender/food processor and blend. Serve immediately with blueberries and a little coconut milk poured on top. Lately I’ve been using mixed berries (blueberries, raspberries and blackberries). It’s a great alternative to sugar filled ice cream that I usually crave late at night. I can’t wait to try this for dessert tonight- thanks! I mix Chia seeds with Nutella and put on toast. Fills me up and energizes me! I tried that Nutella once. before I read the label of contents. It’s a sugar high – delicious till you read the label. I put it back where I found it. Not gonna lie…this looks totally weird. But I’d be willing to give it a try! I can use all the extra hydration I can get! I’m in LOVE! I just started using chai seeds in…everything, and I’m hooked. Running to the store for limes right now! This looks super interesting! Do you happen to know how long chia seeds will keep in a cool, dry cupboard? I have had mine for a year…possibly longer! Eek! i grind SOME chia and flax seed in my coffee grinder with turmeric powder and cayenne pepper then shake it over my steamed veggies and add liberal amount of olive oil. now i heard that chia seeds eaten without lots of water will leach moisture out of the body and cause dehydration. is this true? I’ve never heard of this but now I really want to try it! I think I’ll give it a try this weekend- while at home in case I end up with them all over my teeth. And I can definitely see why people think there are bugs in your drink…cause I kind of thought it at first. Oh girl…you are more brave than I am! I eat chia seeds every day, usually in my oatmeal or sometimes I’ll just straight up do a “chia shot” and down 1 tbsp with a swig of water but I cannot do the whole “pudding” or “gel-drink” thing. It’s a texture thing and when I tried it, I almost gagged! LOL Hats off to you for being able to do that! I know, I’m a wimp! heh that sounds like my husband…to each their own, right? I had similar feelings, I tried some kind of breakfast pudding thing(mixed with almond milk) from another website and I DID gagged when I tried to eat it, the texture was horrifying! However after it sat and got closer to room temperature it wasn’t as goopy and I was able to eat (really drink) it. So maybe trying that route might help. For now I just mix them in everything else. I’m in the straight up “chia shot” club. I figure those little suckers can gel up in my tummy. Should still get the benefits…..right? I found that if I drank it through a straw I could swallow it better than having it fill up my whole mouth. I liked it better with a bit more lemon juice added. That is just what I’ve been looking for! I’ve been adding chia to my occasional smoothies but was perplexed as to how to include it in my daily life. Thanks! I cannot wait to make this and freak out my co-workers! I bet it would be so good with coconut water. Also, is that picture on top a glass bottle?? Where can I get one of those? I think it’s from Crate and Barrel…got it on a sale rack if I remember correctly. Not sure if they still stock them or not. I like this, nice and refreshing for those warmer temperatures we’ve been getting. I’m wondering, is it thick like a smoothie? Or more like drinking water or juice? I have consistently heard such great things about chia seeds and their health benefits. Thanks for providing an idea of how to incorporate these into one’s diet! I can see why you may get the weird looks – it’s soooo … “cool” looking. I kind of want to steal my co-workers chia seeds and try it out right now. I love chia. I love chia puddings. But the drinks… I try. They are hard to drink because I don’t know whether to chew or swallow. LOL! Neat! This sounds like a fabulous idea. I can just imagine the looks you get at the gym LOL but little do they know how much healthy goodness you are treating your body to! I double dare you. hah…sorry couldn’t resist. I’m afraid you are conflating some of the elements of the book, Near the beginning, the author was given a drink that he said gave him a boost of energy. The Tarahumara drank the same thing, but it was corn beer that fueled their distance runs. No matter, though, as this is a wonderful addition to my healthy drink choices, even if I didn’t sense the same boost of energy. I just love, love, love this!!! It reminds me of a healthier version of boboa!!!! I love chia seeds, but have never had them in just water before. I will have to try it! Oh, the texture! I don’t think I could do it! I LOVE this idea but I am a texture issue person. Do you think soaking and then throwing them into the Vitamix to reduce the…bumpiness…might help? I’m chronically dehydrated due to a medication I have to take and I’m always looking for something to help! I do chias in my granola and oatmeal…love them and I have a ton! This is great! I have a whole jar of Salba that I need to use up, which is supposed to be similar to chia. Could I use that instead do you think? I usually put it in smoothies and oatmeal. I will be trying this next. I am not a fan of lemon or lime,but I am going to try it! I am so glad you posted this! A few months ago I saw someone drinking this and I have been wondering what it was ever since, it was driving me crazy! Now I finally know, and am kind of upset I never asked her, because this sounds amazing. I drink this every so often. Nice change of pace from regular ol water :) Though it never looked as good as your photos. My chias either clump at the top or at the bottom. lol. oh i have got to try this! i buy those mama chia drinks all the time and i LOVE them. But they are so sweet. I’m sipping on this right now and its so good! Love lime anything so this is win win! Great idea to make this drink at home, never even crossed my mind. I get the Mama Chia drinks at Wegmans and they are delicious. The description is perfect; water with gel-y seeds is exactly what it is! Love this!! I will be trying it for sure. Can you also tell me where you got your bottle from? I think it’s from Crate and Barrel (on a sale rack), but not 100% sure. This looks so intriguing!!! :) I love chia seeds so will definitely be drinking them soon ! My favorite way to have Chia seeds is to put a good tablespoon full in a large glass of unsweetened Almond Milk, stir, let sit in the fridge for 15 minutes, stir it again and enjoy. Voila!! I love this! It’s my new evening snack. Thanks for sharing! Do you remember Orbitz? That drink with the tapioca balls from the 90s? This reminds me of that drink! I find it so hard to stayed hydrated in the winter…I find water so blah. I’ve been drinking water with lemon a lot, but I will have to try this for sure. Thanks! Haha you are my twin. I was just thinking the exact thing… it reminds me of orbitz! I also struggle with hydration, especially in the winter. I’ve been filling up a jug of water and putting two bags of decaf green tea in to steep for a while. I find it a lot more tasty than plain water. 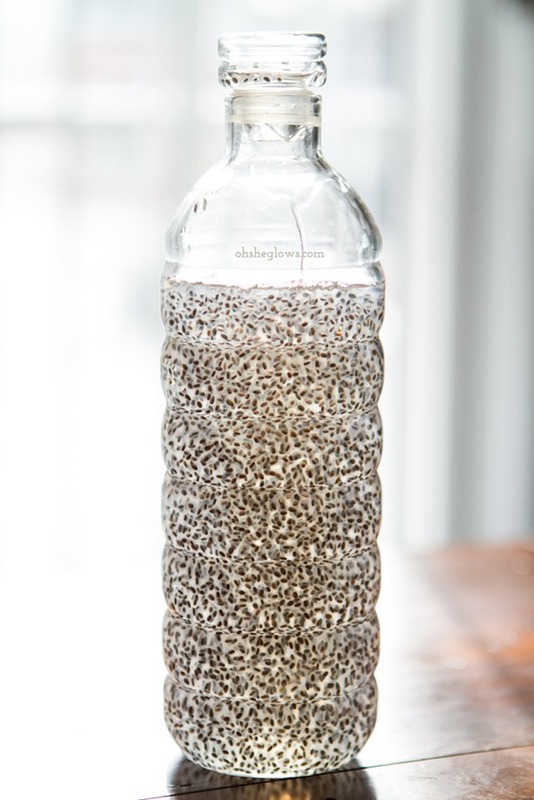 When I added chia seed to my glass today they all sunk to the bottom and stuck together like frog eggs. Not a good mental image but it tasted good once I got over that. Ok Ange, now you’ve got me curious about trying this!! I have heaps of chia seeds but haven’t been using them lately because I haven’t been drinking as many smoothies (darn cold weather!!) Now I have a new use for them! The jelliness sort of reminds me of that Asian aloe juice that you can get in the ethnic foods section of the grocery store. I haven’t tried that yet either, but I imagine the textures would be the same. Great idea for hydration! I was just going to comment that it reminds me of Aloe juice. I LOVE aloe juice but usually it has grape juice in it so I always keep in mind that it’s probably the grape juice flavour and sugar that I like haha but the texture is so cool! Looks interesting! I like chia so I bet I would like this. I’m not a huge fan of boba but any way to get a bit more omega 3’s in, I’ll try! I think I’d really dig this because I love Mama Chia drinks, they are just so expensive! Ahhh… I love chia…. Thanks for the great idea! I didn’t have any lemon or lime, so I used the juice of a clementine and it was fantastic! How ironic! I just saw a recipe for chia fresca on my new package of chia seeds yesterday and had meant to look into it more. Now I don’t have to! Thanks! I use the same ingredients but put them in the vitamix to make a “gel” for my athlete hubby to take for bike races. Same great benefits, no texture issues and you can use it with standard squeeze gel containers. What kind of chia seeds do you use? I read about this and tried it a few months ago. Didn’t add citrus though – that would be really “fresca!” I like the consistency of those little seeds. You can kind of crunch them in your teeth. And there’s no doubt they add great health benefits. Another interesting Mexican drink is Horchata. Their version of rice milk, with a sweet and spice twist!! I was hesitant to try it in San Diego at Cinco de Mayo in the Old Town, but the man beside me told me I just had to! Here is to embracing foods (and drinks) of the world! But if you do not chew them you won’t get the benefits of the seeds, right? I have heard that they are like linseeds and will go through your system without being digested, if they are not ‘cracked’ open first. Hey Jeanne, Chia seeds don’t have to be ground to be absorbed (at least that’s the consensus I’ve read from multiple sources), so I would assume they don’t have to be chewed either (however making chewing movements while drinking things like smoothies apparently helps release digestive enzymes?) I’m not an expert on this, so it’s worth reading up more on if you so desire. I’ve heard that chia seeds (along with aloe) can also act as a natural detoxifier because the gelatinous-fun has a way of pulling things that are difficult to digest through your body. Anyone able to corroborate? wow – this looks great Angela – a must try for sure!!! I really enjoy your blog and I share much on my Pinterest. Thank for the inspiration striving to live a healthier life! 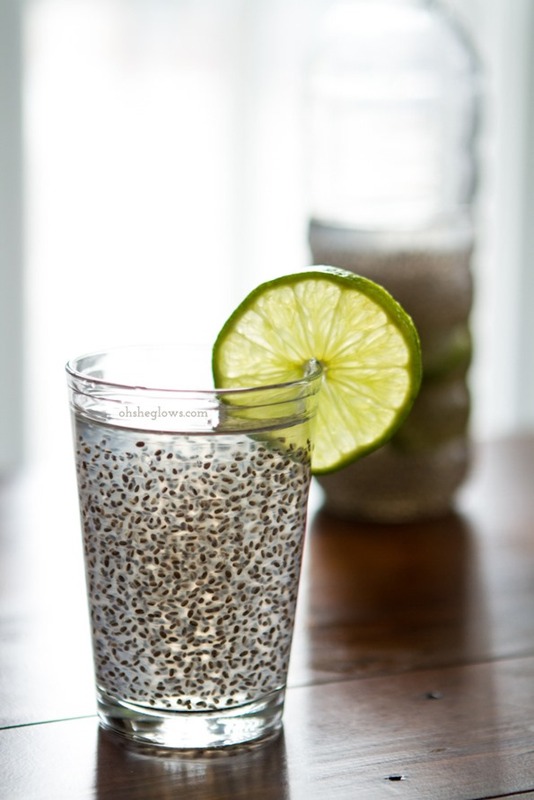 I have never tried chia fresca but really want to make it! Thanks for this post! Ps your pictures look so cool! This sounds like something I’m willing to try. However, do the chia seed actually get digested and absorbed if you’re not chewing them to break them down? Flax seeds need to be ground or well-chewed to reap their benefits. Are chia seeds different? Hi Amanda, Yes chia seeds are different than flax – chia seeds don’t have to be ground to be absorbed. Another reason I use them more often than flax. They also have a longer shelf life. Wow I love the idea of this and am going to try it soon!! I often have lemon-water ((my tea)) in the day but never thought of adding chia :) thanks!! Is it as refreshing as water, with the texture?? Yes I find it very refreshing…esp with the lemon or lime and a bit of sweetener. I’m in love with it lately. Sound great during the summer when I over do it outside. I use Chia seeds in V-8 drink with hot sauce for breakfast drink. Just a side note if you haven’t used Chia seeds you might want to start with a small amount because it has lots of fiber and might cause a little discomfort. it really looks kind of odd, but I bet it’s awesome for your energy level! I could need something like that right now! Welcome Cindy! Thanks so much for your lovely comment. I can’t wait to try this, I just started adding chia seeds to smoothies and yogurts, but this looks great! I put chia seeds in lemondade to drink at school. One day, one of my students asked if I was drinking frog eggs!!! Hi Angela! I just have to say that these photographs are gorgeous!! I love following your blog and normally don’t comment but I had to take this opportunity to thank you for your inspiring, motivating and just plain lovely posts!! Hi Christina, Well, thank you so much! I appreciate it and thanks for reading! Oh! This is so new and cool to me. I need all the help I can get with energy and I am putting chia seeds on my shopping list right now. I love it. A great way to get some chia seeds into the diet!! Keep the great ideas coming! An inspiration to us all. You make it look so pretty! And I love your name “chia bugs”!! 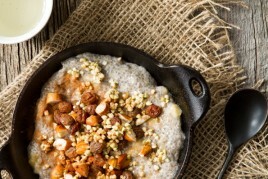 You mentioned some awesome benefits, and I have a post on chia too that I’d like to share :) http://fresh-you.blogspot.com/2012/05/chia-seeds-energy-food-of-aztecs.html Happy Sunday! thank your for bringing it up. I tried it last night with lime juice and didn’t mind the texture at all. I found the lime juice made it taste a little medicine-y so I’m trying it with just water and chia today! I’m excited to try this! Do you think it be ok to use ground chia seeds? I happen to have a bag that someone gave me and other than adding them to bread they aren’t being used much… Otherwise I have whole seeds too but I use them for oatmeal etc. Hmmm also do you know if the ground seeds lose much of their nutrients? Maybe using ground would defeat the benefits of this drink!? I think using ground chia seeds might turn out very gritty – but that’s just my guess. Let me know if you try it! Where is the glass water bottle from? I love it! and this idea! I have been drinking this non-stop since you posted this! It tastes great and is an easy way to consume chia seeds and get those great benefits of the slimy lil seed. Thank you a million times! I will definitely be trying this soon. I have been looking for something refreshing to sip on in the afternoons while I write. The texture sounds fun to me and I think lime with coconut water would be divine. Thanks for sharing the recipe! tried this yesterday…SO good and refreshing! People should be warned that chia seeds lower your blood Pressure, and should not be taken if you already have low blood pressure. I am a distance runner and have very low blood pressure, and I started to add chia seeds to my smoothie every morning and I blacked out twice before I realized what was causing it. Nope nope nope nope. Lol. Definite texture issues here. Not only is chai a superfood for humans- it’s a superfood for dogs! It comforts their tummy, makes their coat shiny from omega 3’s and is a great source of protein. Who new chia pudding was good for me and my furry friend :) Just thought it was interesting to share!! Thanks for the great recipe! I’ve seen those in Whole Foods! I feel like this would be good with iced green tea! I MUST make this. I love koombucha with chia but I’ve never considered adding it to good old water! I bet the fresh lemon juice makes it super fresh. Thanks for the fab idea! So neat. I am willing to give this a try, but I don’t know if I can get past the thought of drinking “tadpole eggs”. LOL Really slimy looking, but I eat chia’s every day, just not in a beverage. Will give it a shot. I LOVE the photography for this!! Based on looks alone, I would gulp this up!! I was gonna ask if you gave them a toothy (read: chia seed) grin in spin class! I do love chia seeds, but I think I would fall into the hate-it camp. Although chia pudding isn’t bad. Hi, Angela, I love your blog and love the look of this drink, however, the nutrients in chia seeds are not absorbed unless they’re ground or micro-sliced. If that doesn’t happen, either from your spice grinder beforehand or your teeth while you’re imbibing, all of chia’s nutrients are flushed, literally. Hi Pamela, Everything I’ve read over the years says that chia seeds don’t have to be ground to be absorbed. Did you find this info somewhere? I’d be curious to read more on it. Yes, actually just last week I was reviewing the book “The Aztec Diet: Chia Power” for a magazine I write for. 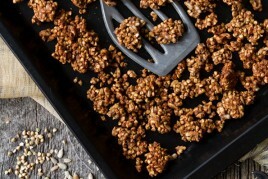 The book’s author, Dr. Bob Arnot, says “If you buy the whole seeds, you should grind them in a coffee-bean or other grinder, as whole seeds tend to pass through the digestive system, and eat them right away so they don’t go rancid.” I found the same to be true of flax seeds, but perhaps chia is different. Hmmm. Anyway, I think they look way cooler whole as you have presented them. Reminds me of bubble tea. I’ll just say that chia seeds go right through me (of you know what I mean). This makes me think that I’m not getting the full nutritional benefit and that next time I buy chia, I’ll buy ground. I think it is false, all those things we have read saying that they don’t need to be ground to be absorbed by the body. Thanks for this ! Sooo yummy. I tried your recipe and one without citrus or sweetner and i found i preferred it just water & chia! When we’re home, I add chia seeds to oatmeal, yogurt, applesauce, etc. for my daughter and me. But…sending her food to daycare is a different story. My daycare provider is amazing but doesn’t exactly understand some of things I send for my daughter. Chia water would send her over the edge! I love making this, and the strange looks and comments at work just make it even better! Wow, this looks really interesting – I’ll have to give it a try soon! Absolutely love this stuff but I do have one question, Angela…I seem to have to pee excessively when I drink the chia and I’m wondering if this is a good or a bad thing. I’ve been drinking your chia fresca on a daily basis. Is it possible to have too much of a good thing? Hi Jocelyne, Hmm I am not sure…maybe you are consuming more water than usual and just not realizing it? If it bothers you I suggest speaking with your doc about it. now I have Chia seeds at home. I put them into water – like you suggested – I put them into my smoothie, my pudding… Is there a maximum of teasponns a day I should take? I couldn’t find an e-mail to send this to, but I thought I’d let you know I had a dream about your blog last night. I check your blog daily and since I do have vivid dreams, I’m not surprised. I donated blood today and so I just made this because I need to sty extra hydrated. I did honey instead of maple syrup and some lemon juice . Really refreshing! Hmm, I just made my first batch and my chia seeds aren’t evenly distributed/suspended like in the photo. I used lemon juice, filtered water, the seeds, and a bit of sweetener. It’s been ‘brewing’ for about an hour, and I shake it every 10 min. or so. About 2/3 of the seeds are floating at the top, the rest are still at the bottom of the pitcher. Is it ‘done’ when all the seeds have floated to the top? Hi Laurie, This sounds normal – the chia seeds can float or sink. For my photos I gave it a good stir right before shooting. 10 mins is plenty to soak in my experience. enjoy! This is one of those rare times when I see an OSG recipe I don’t have to take a trip to the grocery store for :) I had everything on hand and made it right away! I LOVED the chia fresca. The texture doesn’t bother me…just let everything wash over your palate. And, I actually think I preferred the second version I made, which was without lemon juice and sweetener. Just straight-up water + chia does it for me. my daughter and I always add chia seeds to our fruit smoothies. Love it!! I always buy the drinks with chai seeds already in them, but I’ve never made my own. Seems easy enough…thank you! Chia drink sounds interesting. Does it feel weird to drink since it’s all little seeds? Love this with pineapple coconut water. I drank it everyday since I read the article. I even made on and gave it to a friend of mine! She loved it as well. Thanks. BTW…I always make mine the night before and it works great!!!! The drink looks so strange, but at the same time I am very curious to try it out. Thank you for the post. Your blog is so adoreable! I simply love it. Just bought Chia seeds, will make the Chia Fresca as my post-run drink tomorrow. I am obsessed with your cookie dough ball recipe..added it to vanilla ice cream…oh.my. best ice cream ever. So glad I found your blog, I follow many, but all I can say is – yours is the best! I made this today — with stevia for my sweetener. It is so so yummy! …but my husband said he thinks I don’t know how to drink it yet — I guess I have trouble knowing whether its liquid or solid, lol! I drink chia fresca everyday, and I have to say that besides all of the other health benefits I definitely feel an energy boost. I have even began skipping my morning coffee (some days). However, I do get bored with it once and a while so sometimes I switch out the lemon/lime juice and sweetener and go half and half with water and grapefruit juice/OJ. Also, I’ve found if you can’t handle the texture, you can reduce the amount of liquid and the seeds will create a gel (think Gu Gel) with the same benefits. I used to work at a natural foods store and we sold kombucha with chia seeds in it. When people asked, we likened the texture/consistency to “drinking tomato innards”. I loved it, but some people can’t handle the sliminess. thanks for a great idea for a drink !! that’s my new “go-to” drink in the last few days. i make mine with some lemon and whole, frozen raspberries. BTW- cheers on your blog from an Israeli follower. i have been reading your blog for two years now and have used so many recipes and ideas in my everyday cooking. What a great drink–thanks for sharing! For a variation, instead of water, I tried both Fresca (don’t have to add any sweetner) and sparkling water–both turned out great. I also made a chia seed “concentrate” where I added the 1.5 TBSP of seeds to only one cup of water, stored it in a jar, then added the seed mixture to sparkling water. Yay I’m so glad you posted this! I love the chia seed kombucha drinks by Synergy and always wondered how you get the seeds to not turn into a pudding! Plus this is wayyy cheaper than buying it pre-made! Thank you!! Can I ask you where you buy your chia seeds? I’ve been tring to get them in bulk but just don’t know where to get them and where the best deals are. I love the tip about adding maple syrup as a sweetner. I’d never thought of that but now really want to try it. I’m just curious if you’ve ever had any luck baking with Chia? I’ve rad you can used seeds that have been soaked to replace about half the recipe’s fats but every every time I’ve tried it’s been a total failure. Maybe it’s just not meant to be. I hate pulpy orange juice but i LOVE this! I don’t usually have texture issues (with the exception of that o.j. pulp!) so i thought I’d give this a try and it was great :) Actually, i was sort of playing around with the little jelly seeds in my mouth! Love your website – my son and I tried the drink – it isn’t that bad and I felt pretty good afterwards – thanks! I tried this yesterday and was pleasantly surprised at how good it tasted. Made me full and kept hunger at bay for a few hours. Will use this more often. These look awesome! I love that they can stick in my teeth so that I can crunch on them for hours! As they can absorb a lot of water, can they also work as an appetite suppressant? This is very enticing. I love chia seeds, too. However, be sure to note that they can lower blood pressure & are good for moving your meal along (sometimes too good). If you have low blood pressure, as I do, be sure to start out slow. My body can only tolerate about 1/2 of a teaspoon of seeds before I feel ill-effects from it (ie. greatly reduced energy levels). Also, my husband can only take about the same or he is running to the powder room. They are great, but caution should be taken when first introducing these into your diet. Happy eating & drinking! I love your website!!! I’m pregnant and on bedrest, so I was perusing the Internet as I do,and happened upon your website a week ago and have been steadily reading all of the posts from the beginning ever since. Talk about mad pregnancy cravings! Can’t wait until i can freely make it to the kitchen again. Oh gosh, thanks or letting me know! I’ve never seen anything like this before, and since I’m a Chia lover and love lemons too I would definitely try this today!!! I really like the idea. Thank you very much for sharing! What a great idea! I was wondering if i makes this with ground chia seeds and put it in a metal water bottle, will the chia stick to the sides? Hi Alison, I haven’t tried it with ground chia…I don’t think it would have the same consistency as the seeds. Where did you learn about this drink originally? & how long can it last after being prepared before it becomes less than savory? Tried it today love it my only question is can you have too much Chia seeds? I drank it all day and I have it my smoothie as well as in some homemade energy balls I found on Pinterest. Can too much have an effect?? I have recently started drinking chia seeds along with water and a little lemon juice and honey and I have to promise it does get to me, but then I patiently keep telling myself..Its good for ya…Its good for ya…Did you know that people in ancient India also used it as a kind of an ingredient in a dessert? I guess they cleverly realised that when combined with ice creams and sweets, one does not really mind the glutenous texture! They also have the tendency to hold on to the water content and gives you a full feeling. I am planning to make some kind of a “kheer” with it soon! How is it as a gym drink? Cause I like my water during a good workout. Does it’s still have the water quench, just gellier? And you don’t have to pay $4 a bottle for it! Thank you for this post! I love the Cherry Chia kombucha drink and have been wondering if I could make something close to it at home for a lot cheaper. I think I’ll try making this and adding a little lime and cherry juices to it. Also, I finally made coconut whipped cream last night after having the can of coconut milk in my fridge since October and now I am in love. Have had it mixed with some fresh berries for the past few nights . . . and the next few nights. Thanks for all of your recipes and information! I love this drink! I’ve started adding fresh ginger, about 1 tsp, and it makes it so that there’s no need to add the sweetener! Definitely nice having a straight foreword and easy way to eat chia (and all the nutrients that come with it). Wahla! Finally a drink that helps me to like coconut water. Your drink looked awesome, so I tried it right away. Used the 2 cups c.w. and 1 and a half chia seeds then a whole juiced lemon and 1 tablespoon of maple syrup. Threw it in the freezer for ten minutes and drank it down, after shaking each time before a couple of big sips. Excellent! Thank you again for another brilliant idea. Texture issues I have. But I can drink this. I haven’t tried it with water yet but love it with coconut water and the lime. Really refreshing ans a great start to my day. Thank you Angela :) May the sun always shine down on you. hi angela, love your site, its been my homepage for months now, but from today, for the next 10 days im only gonna eat recipes from your site. Good luck to meeee!! Gotta say Chia is very popular here in Mexico, but here we mix it with “flor de jamaica” (hibiscus in english, I think so :P). The only thing you gotta do is get dried hibiscus flower, wash it and pour it in water and bring it to a boil. After that you are going to get hibiscus concentrate. Add water and sweetener to taste(but no to much) because you are going to mix it with you Chia Fresca. “flor de jamaica” is well known for its diuretic effects and is always present in Mexican diets. This looks fantastic, I add Chia to everything and make Chia gel but had never thought of using less seeds and making it a drink. Off to the kitchen right now. Do you have any suggestions on where to get chia seeds for a reasonable price? I’m a student so as you can imagine I have a tight budget. Thanks! I found a decent amount this weekend at Trader Joe’s for like $5. Hope that helps! It does take a little getting used to! I love chia seeds and put them on everything! Thanks for the amazing blog! Tried this today with ginger juice for an extra little kick. Gave the boost I needed to keep myself from nodding off at work on such a gloomy day. I didn’t use sweetener, as I enjoy the spice of ginger and tartness of lemon. I discovered how to juice ginger by accident this winter when a root froze after leaving it in my car. When it thawed I just squeezed it and juice came out. My friend (her family is originally from mexico) likes to make it with iced hibiscus flower (jamaica) tea. It’s yummy! I have a sweet spot for bubble tea made with (nutritionally deficient) tapioca… but, to my suprise, this is even better! I made it this morning with chilled green tea, stevia and fresh squeezed lemon and LOVED IT! Thank you!!! Can’t wait to try a sweetened version. I tried my hand at this recipe this weekend, and it was a success – almost tasting like a weak lemonade :) I carry around a huge bottle of Deer Park with me daily and simply added the appropriate amount of Chia seeds, lemon slices and maple syrup. This will def become one of my staple drinks – thanks! This looks so tasty. How many times a day can a person drink this? I love this ! Sometimes I like to sneak in a shot of tequila ;) great way to get your drink on and NOT get a hangover! Hey! I’m starting a chia FARM! Hey Alison, I’m not exactly sure as I haven’t left them in the fridge for more than a couple days. I would guess as long as it doesn’t smell off then it should be fine. Did I buy a dud bag of chia or do something wrong? Hey there, I’m sorry I’m not sure how long they can stay out of the fridge for. I’ve heard you can sprout them, but not sure how that applies in this case. I drink them daily with water,honey and cinnamon. the gel absorbs the cinnamon so it doesn’t stay on top of the water. It frustrates me if I miss a day. Can you use stevia as the sweetner? i like the way it looks and the concept so I am definatly making some plus I have both black and white chia seeds so maybe it will look even stranger bcause the white seeds wont be very visable!!! This is interesting, I made it today. The texture is different and you kind of feel like you want to chew but I enjoyed it. I drank just 1/2 a glass and I feel full. Will the rest keep in the fridge for a day? I’d like to keep drinking it and see how it helps with energy. I did have to add more water since it came out a bit thick. Thanks! I have been buying Mamma Chia for the past few weeks now, and then the other day I stumbled across your article, whilst trying to figure out a way to bulk order the drinks to save some money, and after a bit of research into some other recipes to make it taste more like Mamma Chia ( 3 tbl spoon chia seeds + 1 cup of water + 1 of your favorite juice) and a short trip to Whole foods, I’m now enjoying my own Chia juices from home at a much better price! Thanks so much for giving me the inspiration to make it at home! For a desert-like drink, I add chia seeds to my holiday coconut nogg. It makes it thicker and adds an eggy texture. I like making my own “soda” with real unsweetened cranberry juice, sparkling water and a squeeze of lime. This post gave me the idea to add chia seeds as well! I did try your recipe as well but without any sweetener. It was good, but I ended up adding cranberry juice just to give it a little more flavor while still avoiding the sugar. Love the detox recipes you posted. I will absolutely be giving those a try this new year! 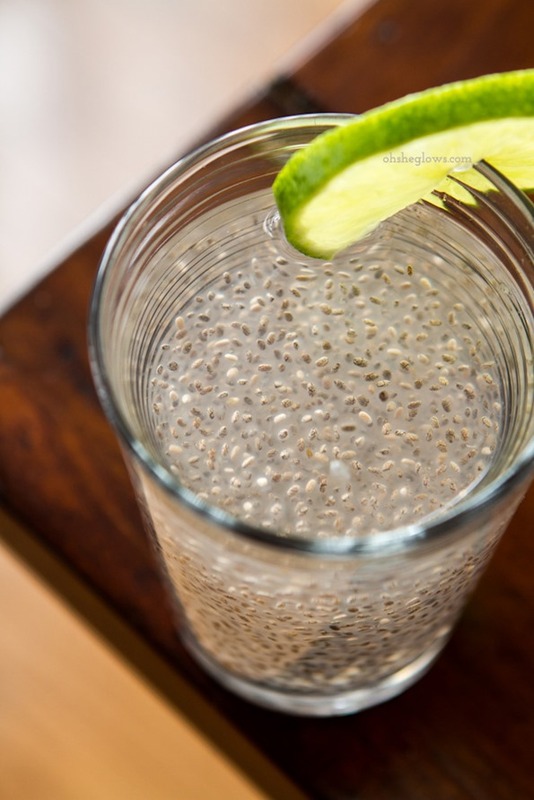 This looks really interesting – never thiught about drinking chia seeds before. I absolutely love this drink! I’ve been having one every morning and it fills me up until I eat breakfast and it’s been keeping my digestive tract happy. Thanks for the great recipe, Angela! I tried some yesterday and I love it! I don’t use a sweetener but I love the lemon taste and I love the texture of the chia seeds. Today I’m hoping to make some VOO! was VERY skeptical about the texture factor of this drink, but as i had a costco bag of chia seeds sitting on my counter i figured, why not give it a try! OMG – SOOOOOOOOOOO good!!! it’s definitely not at all like the globby tapioca blobs in bubble tea that i had been anticipating. so refreshing, delicious and energizing! totally making this part of my regular routine! thanks! I just bought some Chia seeds today I’m looking for ways to use them. I’m looking forward to trying this. Thanks!!! I’m just getting back into running and have recently discovered chia seeds. I get strange looks at the park but I absolutely love the drink. I’ve also been adding them to my oatmeal. Any other chia-y ideas? This little recipe caught my eye and I just couldn’t get it out of my head. Between the warm indoor heat and the frigid dry outdoors I am just getting so dehydrated. I gave this a try-and it is definitely a like it or hate it thing, but I feel and look more hydrated than I have in months. It’s definitely going to become a staple for me. Thank you for posting it! Yummmm, I just made this! I warmed up some frozen blueberries and added honey as a sweetener. It was like tea! Love it! Chia Fresca? Love it! Thanks for sharing such a great drink recipe! I’ve been growing chia as a microgreen too. Just in a little soil. They sprout like crazy and taste really unique, almost lemony like sorrel. P.S. Love your writing! You’re so funny & informative. I like to drink lemon with warm water in the morning – can I add chia seeds in warm water? Thanks for the post! This sounds so interesting. I just bought some Chia Seeds & can’t wait to see how I feel after it! I just tried this – I honestly thought I would hate it because I hate texture in anything I drink. BUT I put it in a regular glass and used a straw and it’s actually quite yummy! Jack, I was referring to my OWN husband with texture issues, not all men. Relax. You can use either type, doesn’t matter much! I got an idea to mix chia seeds with water, lime and stevia and putting it in those Popsicle molds..I thought the icy texture might help with the texture of the gel like chia seeds,,,What do you think about this? Do you think it would be worth a try? First off, I am a huge fan of your work. Amazing recipes with stunning photography, but of course you probably hear that everyday! I am writing to request your permission to post your photo of the Chia Fresca. I am writing a blog post featuring Bob’s Red Mill’s Ancient Grains of Discovery, and I’m selecting one perfect recipe to go with each grain (something simple, healthy, and delicious). I would love to include the recipe title with link to your recipe (not reprinting recipe on my post), and a photo (with full credit of course). Do I have your permission to do so? Please let me know as soon as you can. PS. I am Co-Founder of The Heart’s Kitchen, a company I started two years ago after working closely with Oregon Health & Science University and their research on maternal nutrition and fetal development (the strong link between what mom eats throughout pregnancy and her child’s lifelong health). I am so excited to now dedicate my energy to supporting women & children’s health, good food, and the beautiful art of cooking! I love your story and share a similar background that has led me to this work today. I have trouble getting my chia seeds to stay suspended in a drink form like this. They always sink. Any tips? My husband’s response to me making this was hilarious! Going to give it a try for a pick me up after my morning run. I found if you drink it with a straw the texture is a non issue. I like to put mine in coconut water overnight so that the chia seeds have time to “come alive.” This is a healthy dose of omega-3s, the kind of “healthy fats” that keep you young and limber. Chia fresca for life! Delicious! I just tried it with aloe vera juice, also tastes good. Just so you know, there are 3 main forms of Omega 3 (EPA, DHA, and ALA). In order for the body to make use of ALA, it needs to convert it to EPA and DHA. Conversion rates are extremely poor. 8% ALA turns to EPA and 0-8% turns to DHA. Chia seeds only have ALA so even though they have a lot of Omega 3, it’s the wrong kind and our body can’t process it very effectively. Algae oil is a great source of DHA – and it’s eco-friendly too. That’s where the fish get theirs from anyways. Can I store a chia & water mix at room-temperature in a closed container? Or must I refrigerate it? I have a problem with my intestines and have to stay away from seeds do these seeds disolve in your intestinal area? Love this! Drink it every day. Thank you! where can you get these chia seed I looked at walmart and I seen different typed and even prices vary from $16-$130? I also like to make it with tea instead of water or coconut water. And it tastes wonderful! You cookbook, and blog, have changed my life. Currently recovering from an eating disorder, and have been vegan/grain-free/dairy-free for 4 months. The change has been remarkable. Your recipes make me feel good, they make me happy, and they satisfy my salt and vinegar and chocolate cravings….. which come every 6 hours! If I’m this hormonal now, what will pregnancy be like… eek! I always get a good giggle in reading your posts, and then remember not to take myself too seriously. It feels so good to be able to enjoy food and sweets again, not only NOT feeling guilty, but knowing I’m bringing variety and nourishment to my body! I try to stay away from seeds because of diverticulosis. Anyone know if chia seeds are safe enough? Just started on chia seeds yesterday. I’m mixing them with almound milk bananas and blueberries for a smoothie its pretty good. I love to make something very similar to this… The only difference is I add fresh pineapple juice instead of lemon/lime juice and then I omit the maple syrup. Delish! Thank you of introducing this to me! This drink is what got me through my long days prepping for and writing my exam. I make/drink homemade Chia seed drinks regularly. To avoid having to mix the seeds and them sinking, warm a cup of water then add the seeds and mix, put it in the refrigerator for the next day you will see the seeds have hydrated and have that wonderful gel surrounding them and will remain suspended in your drink. Add whatever other type of juice or coconut water you like to it. I use 1 cup of warm water to 3 Tbsp. of seeds this is good for 2 servings. So in the AM I’ll use 1/2 for my drink and 1/2 for my husbands and add whatever other liquid we’re in the mood for in a large sports bottle. Enjoy!!! I’d like to add that fiber is a serious draw to chia seeds too! 2 Tbsp. contains 12 grams of carbs, 11 of which are fiber! Seriously, blend those seeds into anything you want for added fiber… yogurt, oatmeal, smoothies, etc. I am in love with this drink. I’m going to make some for my son to take with his lunch. He will love it too. Instead of sweetener, I add a single drop of a lively essential oil. My usual is grapefruit because it has great benefits including appetite suppressant so you should feel full even longer! Without the citrus juice, the essential oil can be overwhelming but it’s a great pairing. I’m new to your blog and stumbled upon your blog because so many of your recipes are on pinterest. I’m doing a 2 week vegan challenge. I have to ask the bottle on your chia fresca recipe. Where did you get that bottle? It looks like such a cool glass jar/water bottle. Hey I just started drinking this!! I just have one questions how many cups can I have a day? This was awesome, especially with my fave coconut water- Zico. I even have my 77 year old father drinking it so it’s definitively delicious. Thanks so much! Definitely a keeper recipe. This was so good. I used Zico coconut water , fresh lime juice and maple syrup like you suggested. I’ve been saving and washing out my GT glass kombucha bottles and this recipe fits perfectly in them. I make a few ahead of time and store them in my fridge for quick grab and go access. Do you know the refrigerated shelf life? I even see these at Whole Foods now in their refrigerated section so I’m sure they will be good for a bit. I want to make some for family members for Christmas. 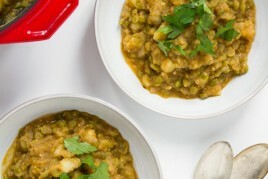 Thanks again for this delicious, healthy and easy to make recipe. 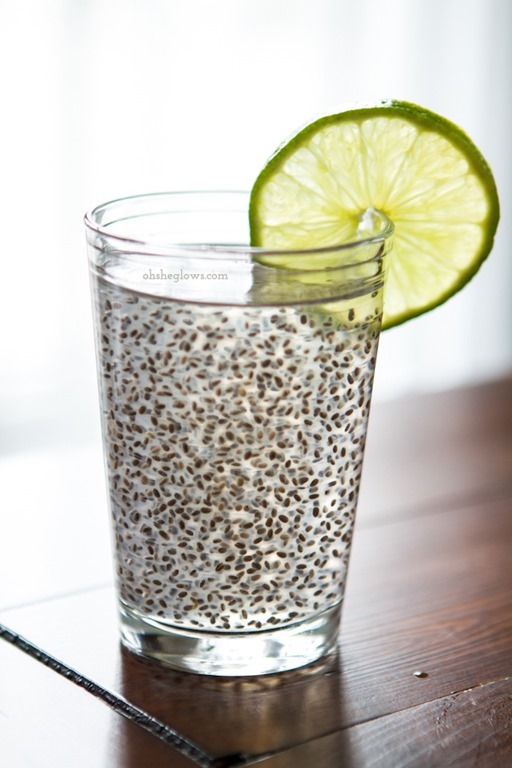 I’ve been drinking this after my workout… the first time I had trouble with the texture, but now I look forward to gym days so I can have a chia fresca… my question, however, is should I be drinking this before the gym instead of after? Thank you for the inspiration (nice pictures). Make a green tea with some fresh ginger in it. before it is cold, mix it with Chia seeds. Add some water and one tea spoon of Xylitol for the sweet taste (and some benefits :-) ) until my bottle is full. This sweetener is not cheap, but seems healthy, and prevents me from adding any additional sugar in my diet. Of course you can replace it with honey (mix while water is hot), maple syrup, agave syrup, etc..
Leave it in the fridge for the next day. Drink cold after a workout, delicious .. I had this in downtown LA at one of the fruit/juice carts. I got mine mixed with half fresh pineapple juice and half chia seed water…. to die for! If you grind chia seeds up to put in, say, an iced coffee drink, will the chia powder still soak up fluid from your digestive track and cause constipation? 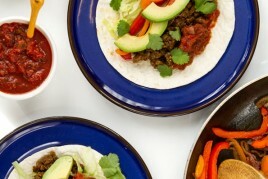 I am researching your awesome recipes for the Wild Rose detox diet. Is it ok to have maple syrup on this cleanse? This is fantastic. I just started running, I’ve been trying to eat low-carb but because I don’t like to eat a lot of mean or dairy it’s been really trying on my energy. Things like this will help give me energy for my afternoon runs. Thank you!!! I’m happy you like it, Kara! My 14 year old son is determined to lose weight and has started keeping this in the fridge. He says to put extra lime juice in it and it is delicious. Added 1 T of bee pollen. Keeps the top frothy which keeps chia seeds at the top. How far in advance can I prep it? Like could I make it the night before then take it with me to the gym in the am? I’ve heard from a few readers, now, that they’ve found prepping it the night before they plan to drink it works great. :) If you give it a go, I hope you enjoy, Alana! I drink chia with rasberry or blackberry juice. So yummy. I can actually chew the swelled chia’s. So good. I am also trying to loose weight so I will try chia with lemon and a little agave or honey. Can’t wait for the goodness to begin. I want know how many time to drink chia water week? Before breakfast or no breakfast lunch time or no lunch time etc? When is the best time to consume this before a running event? Hi Leo, I’m sorry but I’m not sure! Thank you thank you thank you!!! This is my new fave drink! Sweetened it with honey! Delicious!!! Hey Betty, I think chia seeds tend to last a long time when chilled. I think the expiry date on my bags is usually a year or longer. I hope this helps!